Summary: The film tells the story of Jean Valjean, an ex-convict who, inspired by a kindly bishop, decides to turn his life around. He eventually becomes mayor of a town in France and owner of a factory in that town. He is always alert to the risk of being captured again by police inspector Javert, who is ruthless in hunting down law-breakers, believing they cannot change for the better. One of Valjean’s factory workers, Fantine, blames him for her being cast into a life of prostitution. When she dies, he feels responsible and agrees to take care of her illegitimate daughter, Cosette— though he must first escape Javert. Later, when Cosette is grown, they are swept up in the political turmoil in Paris, which culminates in the Paris Uprising of 1832.
Review: God I love this film. I’m not normally one for musicals but saw all the adverts for this when it was just out and decided to see it and I am so glad I did. It is one of my favourite movies and has gotten me into different musicals. The casting is perfect. I thought it would be strange seeing such well known actors/actresses such as Hugh Jackman, Russell Crowe, Anne Hathaway and Helena Bonham Carter in a musical but they did so well and were so believable. They make it seem like they are the characters and it’s the real story of their lives. I can’t praise them enough it’s just so amazing. 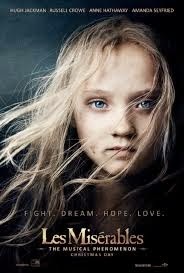 Amanda Seyfried did a great job of Cosette which isn’t surprising considering how well she played Sophie in Mamma Mia. I want to make a special mention of how great Samantha Barks and Daniel Huttlestone were playing their characters. I would go on for hours about the casting because every one of them really did a brilliant job and deserve recognition for it but there’s not enough space or time. The relationships created between the different characters are laid out and introduced well. My only problem is between Cosette and Marius, their relationship is like love at first sight which in my opinion isn’t very believable but in the end it all works out and is effective. I’m going to stop now because I really could go on forever. I would recommend this movie to everyone it’s just so amazingly put together the director did very well. I watch this every couple months and I still think it’s as good as the first time I watched it. So if you haven’t seen it and are looking for something new to watch, pick this one and let me know what your thoughts are in the comments.